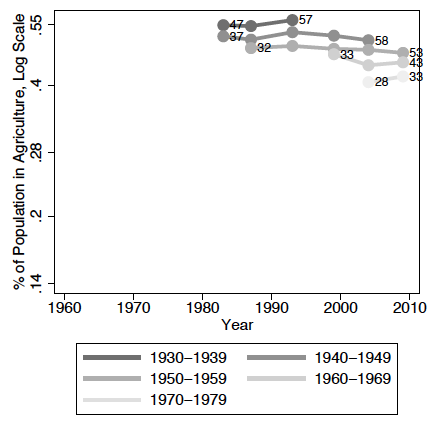 The share of the population employed in agriculture across the globe declined steeply over the second half of the 20thcentury. This coincided with an unprecedented increase in average years of schooling. This column explores whether these two trends are related. 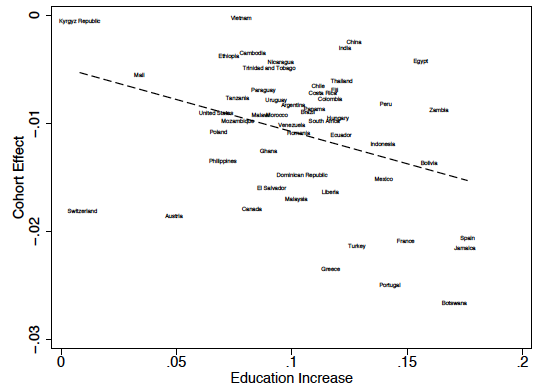 The results lend support to the idea that increased schooling led more workers to sort out of agricultural work. Whether reallocation out of agriculture has been beneficial for growth, however, remains to be seen. What is driving the ‘African growth miracle’? The second half of the 20th century has been characterised by two global trends: an unprecedented increase in human capital, at least as measured by years of schooling; and a steep decrease in the share of the population employed in agriculture. The changes in both schooling years and agricultural employment have been large. The Barro-Lee dataset shows that, on average across all countries, cohorts born in the 1940s spent four years in school, while those born in the 1980s spent nine years in school. Consistent estimates of the world’s share of employment in agriculture are lacking, but most countries for which we have data tell a similar story. In Thailand, for example, agricultural employment fell from 80% of the population in the 1960s to less than 40% in the early 2000s. In Brazil, it decreased from 60% to 20%, and in Italy from 30% to less than 5% (Herrendorf et al. 2014). Are the two trends linked? Or more specifically, did the increase in schooling contribute to the process of labour reallocation out of agriculture? Recent work has shown that more educated workers sort out of agriculture, and into occupations where the returns to skills are higher (Herrendorf and Schoellman 2018, Gollin et al. 2013). 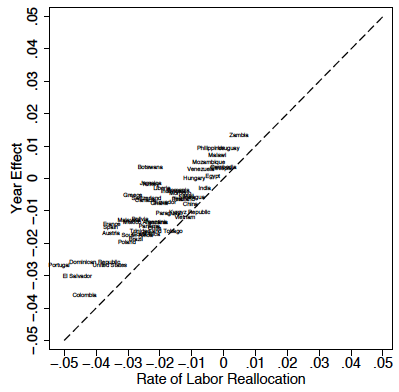 Along these lines, the increase in schooling, by endowing young cohorts with skills that are more useful outside of agriculture, might have led more individuals to search for non-agricultural jobs, effectively reducing the supply of agricultural labour and possibly triggering reallocation to urban areas. While the hypothesis is sound, a formal investigation requires tackling two challenges. The first is to properly measure the change in relative returns from agricultural production across birth cohorts, for given prices. The second is to compute the aggregate implications, in general equilibrium, of the resulting decrease in the supply of agricultural workers. The evidence is consistent with a deep transformation in the characteristics of the labour force that is biased towards the urban sector – younger cohorts are indeed endowed with skills that are more rewarded out of agriculture, and the differences are large. However, the aggregate implications of the observed change in the characteristics of the labour force are in general difficult to compute, and are likely to vary across countries. We therefore provide a range of estimates, depending on the strength of general equilibrium forces. With fixed prices, the increase in schooling might be responsible for up to 40% of the observed reallocation, but if price effects are strong, the net effect of the increase in schooling might have been to pull people into agriculture. We used micro data for 52 low-, middle-, and high-income countries to decompose labour reallocation out of agriculture into year trends and cohort components. We wrote down a tractable theoretical model to interpret the results of the decomposition. Figure 1 illustrates the empirical exercise for two countries: Brazil and India. 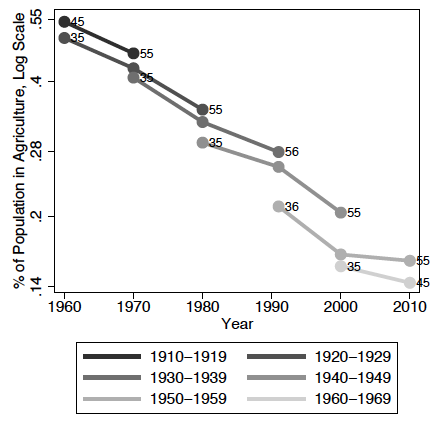 Notes: Each line in the figure represents the share of men born in a decade (1910-1919, 1920-1929,..., 1960-1969) that was employed in agriculture between the ages of 25 and 60, and for the years for which we have available data. For example, the darkest line in Panel Arepresents the share of men born in Brazil between 1910 and 1919 that was employed in agriculture in the years 1960 and 1970. This line does not extend to 1980 since we restrict our sample to individuals aged 25 to 60. Consider Brazil, in Panel A. There are two noticeable features in the figure. First, within each birth cohort, workers tend to move out of agriculture over time – that is, there are negative year effects. Second, younger cohorts tend to have a smaller share working in agriculture – that is, there are also negative cohort effects. Not all countries look like Brazil. Panel B shows India. In this case, within each birth cohort we see almost no decrease in the share of men working in agriculture, while younger cohorts do have a smaller share in agriculture, as in Brazil. We conduct a similar exercise for each country in our sample. We summarise the findings in Figure 2. Following individual birth cohorts, in countries with fast labour reallocation (large negative rates) we observe movement out of agriculture, as for Brazil. At the same time, in almost all countries – even those with low aggregate reallocation, such as India – the cohort effects are negative, which means that younger generations are less likely to be working in agriculture. The cohort effects are large and, in fact, they account, in a purely mechanical sense, for more than half of the total labour reallocation out of agriculture. Notes: Panel A plots, across countries, the average year effects as a function of the aggregate rates of labour reallocation out of agriculture; and Panel B plots the average cohort effects, still as a function of the aggregate rates of labour reallocation. To understand how average year and cohort effects are computed, consider Figure 1A. The average year effect for Brazil is the average slope of the cohort paths in the figure, while the average cohort effect is the average gap between paths within one year. Human capital, frictions, or technology? What can we learn from these new empirical facts? The year effects are simple to interpret. They capture the change in the countrywide return from agricultural production, and they thus absorb the usually suspected drivers of structural change: unbalanced productivity growth and change in demand for agricultural products. The cohort effects, instead, have a more elusive interpretation. A negative cohort effect suggests that the higher human capital of younger cohorts made them more willing to move out of agriculture in search for a proper reward for their skills. However, it may also be driven by mobility frictions which prevent older individuals from abandoning the rural area in search for non-agricultural jobs. We turn to economic theory to distinguish between these two explanations. We develop a simple dynamic model of an economy inhabited by overlapping generations that differ in their human capital. The model allows us to leverage heterogeneity in the reallocation rates across cohorts to isolate the effect of the mobility frictions, which represent any monetary and psychological cost associated with moving out of agriculture. We show that frictions are present, and – as expected – are in general larger in poor countries. 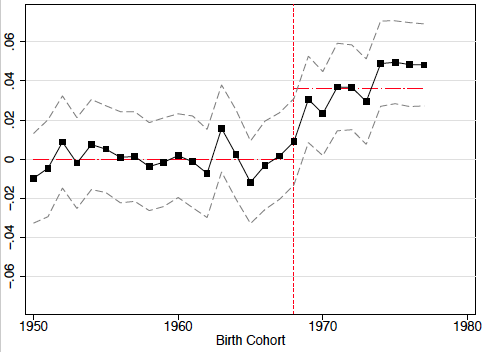 However, we are also able to show that most of the differences across birth cohorts are driven by individuals of younger cohorts having, on average, higher returns from working out of agriculture, and not by frictions. In other words, the supply of agricultural workers has decreased over time. The model also delivers simple formulae to quantify the aggregate implications of the changing labour force, and to show how general equilibrium modulates them. The decrease in agricultural supply could generate – on average across countries – as much as 40% of total labour reallocation out of agriculture, if we keep prices constant. At the same time, the model shows that general equilibrium forces could be powerful and overturn the aggregate prediction under some parametric values. In fact, as younger generations become more productive in non-agriculture, the price of non-agricultural goods could decrease enough to lead workers back into agriculture. This second result does not alter our main conclusion that the supply of agricultural workers has decreased over time, but it highlights the difficulty in making aggregate predictions, which are in fact likely to vary by country and over time, for example as a function of openness to trade. Did the increase in schooling really play a role? So far, we have not directly used any data on schooling, but we have only argued that younger cohorts have a comparative advantage in non-agricultural production. To directly isolate the role of schooling, we compute, for each birth cohort, the average years of education. We first show that, as expected, younger cohorts have higher schooling and lower agricultural employment. This result, however, is fragile, since it could be spuriously generated by time trends in both variables. Reassuringly, we also show that if between any two cohorts there is a particularly large gap in education, then there is also a particularly large gap in agricultural employment – that is, the simple correlation between schooling and agricultural employment holds in first differences as well. Further, we show that the same relationship also holds across countries– countries with a faster increase in schooling across cohorts also have, on average, larger gaps across cohorts in agricultural employment(see Figure 3). Notes: on the y-axis we plot cohort effects, as in Figure 2B; on the x-axis we plot the average growth rate of average schooling years, calculated for each country for the cohorts that are part of our dataset (hence for the same cohorts for which we have calculated the average cohort effect). The correlations just described, while suggestive, cannot be interpreted causally. Ideally, we would like to trace out the effect of an exogenous increase in schooling on non-agricultural employment. Fortunately, influential work (Duflo 2001) had already paved the way for us in this direction, by devising an empirical strategy exploiting the rollout of a school construction program in Indonesia. 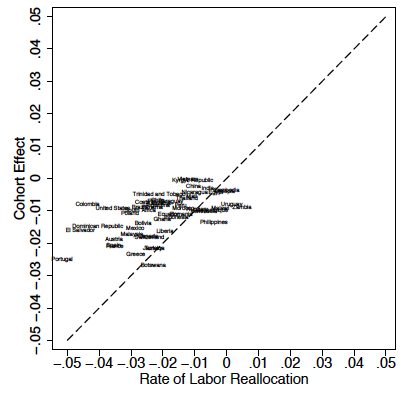 While Duflo (2001) studied the effect of school construction for wages, we replicate her empirical strategy to study the effect of schooling on non-agricultural employment. The results are visualised in Figure 4 – the school construction program led to more years spent in school and a higher probability of being employed out of agriculture. Notes: we run a regression of schooling years (Panel A) or non-agricultural employment (Panel B), as function of intensity of the treatment (i.e., school construction) in a district interacted with birth cohort dummies. In the figures we plot the point estimates that capture the effect of the school construction by birth cohort. 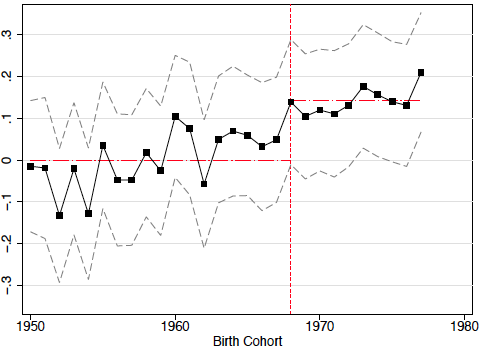 Cohorts born before 1968 (the vertical red line) are not treated, since they were already out of school at the time of the program. As expected, for these cohorts the effect of the treatment is zero. Instead, the cohort born after 1968, in those districts more heavily affected by school construction, have more schooling years and a higher probability of being employed outside of agriculture. Overall, the evidence strongly suggests that the global increase in schooling transformed the labour force and contributed to creating modern economies where individuals are endowed with skills that are more valued out of agriculture. Nonetheless, we wish to conclude with a note of caution. The results are not sufficient to argue that the reallocation out of agriculture has been beneficial for growth, nor that it has been necessarily driven by younger cohorts having higher human capital. They are also consistent with a scenario in which the effect of education on agricultural employment acts through a preference channel. The more educated younger generations could simply have a stronger distaste for agricultural work, inducing them to neglect their rural background in search of urban jobs that could still be out of reach. Barro, R J and J W Lee (2013), “A new data set of educational attainment in the world, 1950–2010,” Journal of Development Economics 104: 184–198. Duflo, E (2001), “Schooling and labour market consequences of school construction in Indonesia: Evidence from an unusual policy experiment,” American Economic Review 91(4): 795–813. Gollin, D, D Lagakos and M E Waugh (2013), “The agricultural productivity gap,” Quarterly Journal of Economics 129(2): 939–993. Herrendorf, B, R Rogerson and A Valentinyi (2014), “Growth and structural transformation,” in Handbook of Economic Growth 2: 855-941. Herrendorf, B and T Schoellman (2018), “Wages, human capital, and barriers to structural transformation,” American Economic Journal: Macroeconomics 10(2): 1–23. Porzio, T and G Santangelo (2017), “Structural change and the supply of agricultural worker,” working paper.